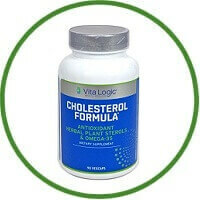 Vita Logic Cholesterol Formula is cutting edge in the nutritional supplement market. This unique herbal formula is both effective and economical. It combines the cardio-protective properties found in omega-3 fatty acids and those found in CardioAid, which consists of garlic, olive leaf, and cayenne. Backed by extensive research, the ingredients help to normalize cholesterol levels. Cholesterol Formula has gain lots of positive outcomes from users. It contains nutrients and herbs that help promote healthy cholesterol levels. Manufactured in a FDA registered and inspected facility which follows GMP guidelines.